Upon reading the introduction to Race and Multiculturalism in Malaysia and Singapore (2009) by Daniel Goh and Philip Holden, I realized that I know nothing on “multiculturalism”. I assumed that the word in some sense valued cultural fluidity and tolerance. But then again…what does “cultural fluidity” really mean either? My point is, previous to this informative excerpt, I recognized “multiculturalism” on a similar playing field to “diversity”, as a vague buzz word which no one in the general public truly acknowledges the layers, history, or politics of. In relation to how multiculturalism functions in Malaysian or Singapore government, Daniel Goh and Philip Holden make the argument that “multiculturalism imposes limits upon the recognition and interrogation of cultural difference”, because of its roots which are embedded within Western ideology. Goh and Holden press question the reality of how a postcolonial society can conceive of and redefine racial categorization which was founded upon white colonialism? Charles Taylor argues that achieving this sort of multiculturalism in a postcolonial society such as Malaysia required “non-ethnocentric” judgement, which entails the “presumption of equal value and worth” among all racial, ethnic and cultural groups. Taylor also argues that state must also reflect equal sentiments towards conserving the rights of all citizens. Considering the politics of Malaysia’s pursuit of multiculturalism in the postcolonial framework, I am curious to further investigate how “multiculturalism” functions within the United States since we too are a postcolonial society. I am interested to understand the argument of scholars and writers who claim the United States is in a post-racial society. Based off my understanding of Goh and Holden’s definition of multiculturalism, the claim or boast of reaching a “post-racial” society implies a failure to acknowledge equality and distinguish between racial and ethnic groups. In reflection of what multiculturalism symbolizes, I find it strange how American culture applauds the ideology of the “mixing pot” which realistically encourages the active devaluing of cultures outside what is western or classically “American”. As an American Studies major, I’ve had a lot of exposure to the histories that contributed to much of the United States’ diversity including the genocide of indigenous people, slavery, and various waves of migration and immigration. Not often, however, do I consider the ways in which other, non-Western countries have become the way they are currently. In an introduction written by Daniel P.S. Goh and Philip Holden of the book Race and Multiculturalism in Malaysia and Singapore (2009), the state of multiculturalism in both Malaysia and Singapore is explained as a direct result of colonization. At one point more specifically, the authors argue that colonial legacies have left a racialized version of multiculturalism. Malaysians and Singaporeans then were left to create a “medley” of different cultural communities from the remaining racialized groups (Goh and Holden 4). Goh and Holden expressed how the governments of Malaysia and Singapore had to “negotiate the colonial legacies of racialization and transform them into postcolonial multiculturalisms” which led to the “creation of a colonial plural society” (4). Such a society is one in which racial and ethnic identities are put ahead of national identity. European colonizers’ left-behind system of racial classification is one that ignites different cultural communities to cling on to their separate religious and ideological identities within their respective groups. I find this idea interesting because contrastingly, in the U.S. groups tend to form sub-cultures only after they’ve been locked out of equal opportunities within larger structures and institutions. Many different ethnic groups in the U.S. wish to claim themselves to be thought of as full American citizens, but their race, religion, or cultural group is often forced into their identity. Comparing Malaysian and Singaporean multiculturalism to the myth of the U.S. “melting pot” brings into question how best societies in general should integrate many different kinds of people into one functioning nation. How do communities preserve their ethnic heritage while still tagging part of their identity to the representation of their holistic country? Goh, Daniel P. S. and Philip Holden. “Postcoloniality, Race, and Multiculturalism.” Race and Multiculturalism in Malaysia and Singapore. Routledge, 2009, pp. 1-8. Multiculturalism is defined as cultural pluralism and diversity by the Merriam Webster dictionary. Diversity of different cultures is handled and talked about differently in various countries, for instance western multiculturalism is different than post-colonial multiculturalism. In the book Race and Multiculturalism in Malaysia and Singapore (2009), authors Daniel P.S Goh and Philip Holden set out to examine postcolonial multiculturalism in Malaysia and Singapore compared to western multiculturalism. Goh and Holden argue that in order to be able to better understand a countries ability to sustain multiculturalism its history of postcolonialism and position in postcolonialism must be analyzed. In regard to Malaysia and Singapore, both countries state and position after colonialism needs to be studied from “the theoretical angles of cultural studies and postcolonial theory” (2). When this viewpoint is studied when discussing Malaysia and Singapore’s multicultural position it can be seen that racial identities from colonial times are still implemented onto political and social life of Singapore and Malaysia lifestyle (3). I am captivated by the different angles that western multiculturalism and post-colonial multiculturalism in Malaysia and Singapore are viewed through. In the United States multiculturalism simply stands for the existence of different races, though many races are not given equal significance in the overall culture of the United States. For instance, when an immigrant arrives in this country their first task is to learn English, the primary language of this country, which simply neglects the other languages spoken in this country. The second task of an immigrant is to learn the “American” culture as quickly as possible in order to fit into society. In other words, less is required in the American view in order to be multicultural. In Singapore and Malaysia, the cast and social system of colonialism are still implemented and therefore it in my opinion seems harder to achieve multiculturalism in a country where culture is an uncertainty. In this way the statement, “historical consciousness plays a major part in the formation of our identities and the definition of multicultural possibilities” (8), emphasizes Malaysia’s and Singapore’s approach to addressing multiculturalism, and I can easily understand the historic importance. hierarchy of races. Daniel Goh and Philip Holden address these issues of “institutionalized identities”(3) in their book Race and Multiculturalism in Malaysia and Singapore (2009), by demonstrating how devastating it is for groups excluded from those categories. can be justified only as long as the fundamental rights of citizens within commitments to other cultures or no commitments are protected” (3). Taylor’s ideas for a fair acknowledgment of all races is contradicted in the forms of state multiculturalism in Singapore and Malaysia imposed by the British. The creation of “official categories” of race create a category know as “other” who do not identify as Chinese, Malay, or Indian. Goh and Holden argue that this system makes it impossible not to “commit”(3) to one of the 4 groups. The groups hierarchal position in society reflects how citizens are treated. I find this interesting considering it has similar parallels of how America views race. We live in a multicultural society and yet it is evident races are treated different. But even before society decides how to treat them, the government must first decide which racial box everyone belongs in. As in Malaysia and Singapore, some races are excluded. Latinos for example are not considered a race despite us being the second largest ethnicity in the United States. Filling out forms leaves many of us confused since we are either given our own “race section” or “other”. If there is no “other” option we are left with the confusing task of categorizing ourselves into races we may not feel accurately represent us. As discussed in class today, similar issues regarding declaration of race on documents appear in Malaysia. It is important to understand that the definition of multiculturalism includes supporting a diverse number of racial and cultural backgrounds. But a problem arises when we have foreign powers imposing their pre-colonial views of race on ethnic people. It creates a huge confusing and unfair mess we are still trying to figure out to this day. Just as cultures vary widely across the world, so do approaches to multiculturalism. Not every multiethnic or multicultural society operates in exactly the same way, so multiple frameworks are required to understand multiculturalism in various societies. In “Postcoloniality, Race, and Multiculturalism,” the introduction to Race and Multiculturalism in Malaysia and Singapore (2009), Daniel P. S. Goh and Philip Holden argue that the race-based models of multiculturalism that currently predominate in Singapore and Malaysia derive from colonial systems of racial categorization that have become entrenched in the societies and politics of the nations (3, 6-8). In order to understand how multiculturalism in Singapore and Malaysia differs from Western multiculturalism, Goh and Holden define it as postcolonial multiculturalism, and the citizens of Singapore and Malaysia as postcolonial actors (2, 4). The authors define postcolonial actors as those who “have no choice but to negotiate the colonial legacies of racialization and transform them into postcolonial multiculturalisms” (4). They understand multiculturalism in Singapore and Malaysia as different from multiculturalism in many Western nations because of their continuous grappling with a colonial legacy. I am intrigued by the fact that multiculturalism in Malaysia is based on ethnic categories that were imposed during colonial rule. Goh and Holden point out that the official categories of Chinese, Malay, Indian, and Others (CMIO) were originally implemented by the British, who believed that people in Malaysia had “‘no clear conception of race’” (4-5). All of these ethnic groups were present in Malaysia and Singapore when British colonization began. This contrasts with the way multiculturalism is represented in the U.K., where immigration, primarily from formerly-colonized nations, has changed the ethnic makeup of the nation. Anti-immigration groups depict England as an ethnically homogenous place being “invaded” by “other” ethnicities, while those who support multiculturalism still expect those who are not white and ethnically English to culturally assimilate. Interestingly, the ethnic categories considered in both national contexts derive from British ideas about what constitutes race and ethnicity and how people should be categorized. British colonialism has played a large role in the way multiculturalism is conceived and practiced around the world. Race isn’t exclusive to the U.S.? To be honest, I’m a huge fan of the word “multiculturalism” because it encompasses people of different cultures, rather than different races (which is solely based off of phenotypic characteristics). Different cultures in one country can lead to a range of discussion. In the book Race and Multiculturalism in Malaysia and Singapore (2009), Daniel Goh and Philip Holden the pre- and post-colonial context of multiculturalism and its role in Malaysia and Singapore. Goh and Holden challenge the idea of multiculturalism and question whether we can understand multiculturalism from a basis other than “terms and categories set by white colonialists” (3). They argue that because it is a Western concept, it is used as the grounds for multiculturalism in Malaysia and Singapore. Multiculturalism is understood in juxtaposition to what white colonialist have defined it as. Additionally, they argue that the state apparatuses weave multiculturalism into the fabric of political and social life to the extent that they are seen as common sense (3). In weaving it into daily life, this understanding of multiculturalism thus becomes normalized, which is what Goh and Holden asks readers to challenge. Something I found interesting was that the concept of race had the same purpose in Malaysia and Singapore as it does in the U.S. In the U.S., the concept of race is to categorize different groups of people. This categorization thus leads to a hierarchy of races, cultures, and ideas. In the reading, it seems like race is also used to for categorization in Malaysia and Singapore. This highlights that race is not just a concept in the U.S., but in other countries as well, and that it is a concept that is used to categorize bodies and generate a hierarchy. Because philosopher Charles Taylor argues that one should approach multiculturalism with equal value that we hold to our own identities, this proves that race in Malaysia and Singapore is manipulated towards some sort of ranking. One can’t argue against something that isn’t already there. While multiculturalism encompasses different cultures, it is still derived from a white, settler colonialist ideology that different countries manipulate. The changing face of racism makes it an elusive concept to address in modern conversations. While outright racism exists, it is the system of institutional racism that is the most insidious. The photo above depicts Irish protesters. 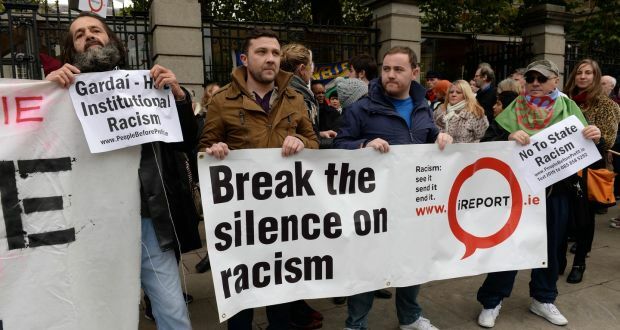 Their protest signs demonstrate their disapproval of the Irish police force and its reluctance to address black victims of violence. Ijeoma Oluo’s So You Want to Talk About Race frames racial oppression in the context of society and describes conversational tools to address the topic of race. Published in 2018, the book provides instruction for genuine alliance with people of color. Oluo states that racism is rarely an individual attribute, but rather an institutional force that continues to oppress people of color (27). This idea is useful, as, I believe, it diverges from the average white person’s perception of racism. When a white person hears the word “racist,” images of “unabashed racism,” such as swastikas or the Ku Klux Klan, may come to mind (Oluo, 27). Framing race as a societal problem, however, points the finger at institutional support in terms of allowing racism to flourish. This idea also permits the opportunity to fight these oppressive systems (Oluo, 36). Multiculturalism, written Ali Rattansi and published in 2011, is a short introduction to conversations surrounding multiculturalism. Rattansi outlines the role that the strive for human equality has played in the origins of multiculturalism. 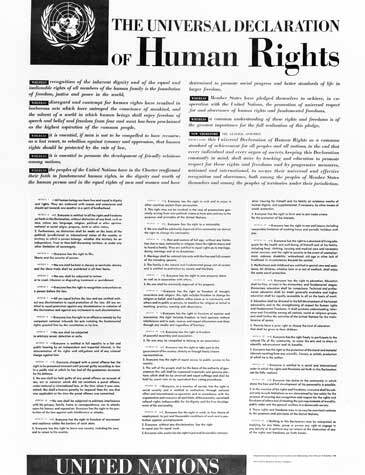 Following World War II, Rattansi explains, the Universal Declaration of Human Rights sparked societal changes towards the idea of race (15). These changes are significant as they set the stage for the progressive social movements of the 1960’s and beyond. These historical moments illustrate that policy changes and social changes are key in changing racist systems. Both Oluo’s definition of race as a societal, rather than an individual, issue and Rattansi’s explanation of post-WWII reversals of racist policies reinforce racism as an institutional system of oppression. Just as racism is a “systemic machine,” policy changes and social movements can function to address the injustices of this institutional problem (Oluo, 28). Oluo and Rattansi’s ideas therefore synergize to explain the societal changes that must take place to address institutional racism. These chances include the recognition of the existence of racist systems by white people and the enactment of policy changes that establish human equality.